Do you think 3D printing is for you? Think again! Do you think 3D printing is not for you? Think again! The generic term 3D printing covers a wide variety of different technologies and materials, albeit with the common goal of producing three dimensional objects. In most cases these objects are created one layer at a time, with successive layers built on top of each other, often with a secondary material to support the object while it's being created. There are many different approaches, such as extruding plastic, heated to a near liquid form, which then hardens as it cools. An alternative is stereolithography, which essentially uses resins that can be cured by UV light to form plastic objects. There are also metal printers that lay down powdered metal, which is then fused into solid objects through the use of lasers. Up to now 3D printing has mainly been used to create prototypes leading to faster product development. But the technology is increasingly being used to produce parts, and is now often referred to as additive manufacturing. For now, this is expensive and slow so tends to be limited to high value applications, mainly aerospace and medical. This includes, for example, parts flying on Boeing and Airbus planes as well as prosthetics and dental implants tailored to individuals. An alternative to producing parts is to make the moulds or even the tooling to enable parts to be made conventionally. Also, some companies are considering using 3D printing to manufacture replacement parts ondemand to cut down on the need to hold warehouses full of spare parts. 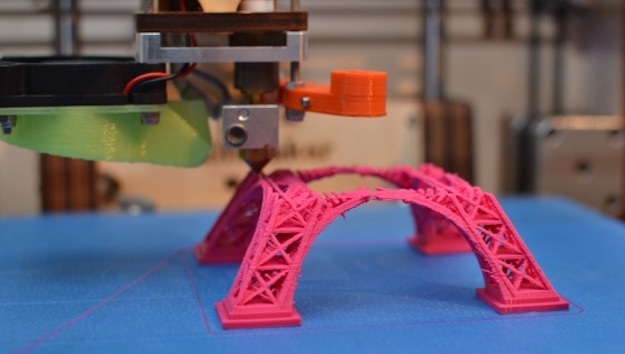 Many of the vendors involved in making wide format printers are also developing 3D printing solutions, though it is debatable as to how much crossover there is between 3D and wide format. There is clearly some synergy with CAD printing, where a 3D printer could produce a model of the CAD diagrams for a more tactile prototype or even model buildings for the architecture market. The other likely market is dimensional and special effects signage. There’s an enormous range of 3D printers available, and since there isn’t space to go through them all here, we’ll instead look just at those vendors that are already known to the wide format market, which offers a good cross section of the available technology. The Israeli company Massivit has developed a 3D printer that is specifically aimed at producing point of sale and brand marketing. This is a market that the Massivit team is very familiar with, most of the senior management having worked for HP Scitex at some point in their careers. The Massivit 1800 is a big machine, with a printing area of 1.5m x 1.2m x 1.8m. It can produce life-size statues as well as special effects for display signage. It can be configured with two heads so you could print two life-size standing human sculptures side by side. It works by laying down a gel-like material, Dimengel, which is a photo polymer acrylicbased material that solidifies with exposure to UV. Once the material hardens it’s quite stable so that there’s no need for any supports and the objects can be hollow. You will need to coat it for outdoor durability. Mimaki is developing a 3D printer and has shown a prototype at the recent FESPA show. The really interesting aspect of this is that it uses UV ink itself to create the 3D objects. The print heads lay down a dissolvable resin to support the object, as well as the ink that forms the object, both of which are cured by UV light. Once the object is printed, the support can be dissolved in a water wash and the UV object peeled away. It prints in six colours – CMYK plus white and clear – so that the objects have the full colour gamut that we would normally associate with a UV printer with over 10 million colours. This is a distinct selling point over the majority of 3D printers, most of which use just the single colour of the material they are printing. Some 3D devices do have colour, but the Mimaki machine appears to have much brighter, more vivid colours. Ronald van den Broek, general manager for Mimaki Europe, says that it can be used to add more dimensions to sign graphics and even production of items such as buttons. But the main market is clearly prototyping. Mimaki has also developed the file handling software to go with it. The machine should be available by the end of this year. Canon has also stated its intention to develop its own 3D printers. For now, Canon has partnered with 3D Systems, one of the main players in the 3D world, to sell its range of machines. This includes the ProJet 660 Pro, which is designed for creating prototype models. It lays down a powdery VisiJet material together with CMYK and clear inks, with the ink containing the binder that’s used to create the object. Other options include stereolithography printers, that print a plastic resin material. Roland has developed desktop milling machines but recently has concentrated its efforts on dental printers. Earlier this year it launched a 3D printer, the DWP- 80S, that was designed for producing dentures, which uses UV-curable resin. But Roland is also working on a ceramic printer, demonstrating a prototype last year. This jets a binder material into alumina powder and can produce finely detailed objects for both decorative uses and manufacturing industrial parts such as ceramic filter elements. The Roland ARM-10 3D printer incorporates a stereo-lithography process with a UV-LED projection system and builds models by successively curing layers of resin from a liquid resin vat. Ricoh has also set up an additive manufacturing business unit and developed a 3D printer, the S5500P. It uses selective laser sintering, which involves depositing a powdered material that is then irradiated with the laser for sintering. It uses materials such as PA12 and PA6, which are high performance nylon-based materials that can be used for functional parts, for example, in the automotive industry. It has a large build area of 550mm × 550mm × 500mm and can fabricate different kinds of parts at the same time, as well as large parts all at once. HP is developing its own line of Multi Jet Fusion 3D printers, which use the same thermal printhead technology as the latex wide format printers. They use a form of laser sintering, laying down a powdered material and then jetting two agents to this. One of these is a coalescing agent that causes the powder to be fused when it's hit by a laser, while the other modifies the powder to give the material specific properties. This could be adding colour or changing the surface texture. Once the liquid agents have been jetted, a laser passes over the area, fusing the powder where the liquid agent has created a pattern. Most of the materials that HP has shown so far have been various forms of thermoplastic but the company is also developing ceramics and other materials and says that it is committed to becoming a major player in the 3D market. There are a number of factors that anyone thinking about using 3D printing should take into consideration. Firstly, most of the machines tend to be relatively slow – the bigger the part, the longer it takes to print. Also, most of the various types of printing also require further cleaning and sometimes polishing before the objects can be used. Most materials can be 3D-printed, ranging from silicon to titanium, as well as thermoplastics and nylons. But objects should be designed specifically for 3D-printing to take into account the material properties, and the appropriate files prepared accordingly. There are few practical limitations and everything from toys to parts for jet rocket engines have been 3D-printed – it really is down to your imagination!